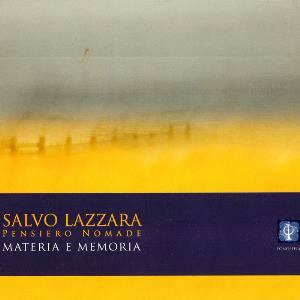 This is the third album of ex-Germinale guitarist Salvo Lazzara's recording project. He has proved to be very capable of creating fascinating soundscapes on his own too, but here the extraordinarily fresh sound is broadened by percussionist Davide Guidoni, Alessandro Toniolo on flute, Luca Pietropaoli on trumpet & flugelhorn and Fabio Anile on keyboards. If you enjoy ambient- oriented instrumental art-rock by e.g. ROBERT FRIPP, BRIAN ENO and JON HASSELL, I warmly recommend PENSIERO NOMADE for you. The album contains 12 tracks, mostly around 3-5 minutes in length. Occasionally there are some tiny voice samples that increase the World Music flavour. I'm definitely not suggesting that this music would lack orginality while I get several associations to some older works. One of them is the PETER GABRIEL soundtrack Passion (1989). The electro-acoustic instrumentation meets the full use of modern studio technology with all the devices, loops, programming and samples, but it never results in an alienating, synthetic coldness. The ambience is introspectively humane and it resonates with the listener's own emotions and imagination. The delicate, often quite slow-paced soundscapes also remind me of the New Agey electronic musicians such as ROBERT RICH, and the Various Artists complations of the German -IC- [Innovative Communication] label, that I used to spin a lot in the early 90's. (Those were my first acquaintances with numerous fine artists from Ashra and Mind Over Matter to Megabyte and Mark Isham.) In a way PENSIERO NOMADE brings me back to those music worlds, but with a bigger dose of timelessness. Production by Gabriele Rampino and the composer Lazzara is absolutely topnotch. This is music to dream away with; soothing and exciting at the same time.